Seattle Center and South Lake Union- A Police officer suffered a serious leg injury responding to protesters who were roaming Seattle streets Monday afternoon. Officials said the officer may have suffered a broken leg and that it was related to the protests, but didn’t give further details. 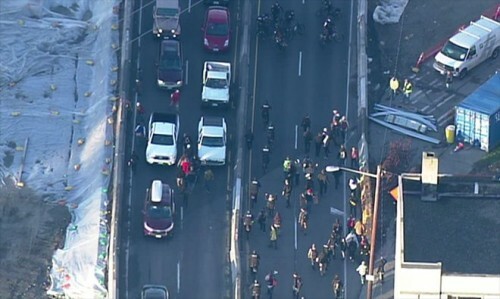 Activists chanting “black lives matter” jumped into traffic and eight of them tied themselves together with PVC pipe and laid down on the highway. Officers gave the protesters warnings that they were going to face arrest, then began arresting them. At least six were arrested.